Dr Toms International - Service Provider of easy braces, easy joints & pappyjoe dental software in Kozhikode, Kerala. 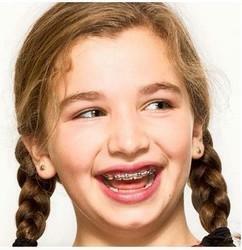 Easy braces was developed to bring about tooth guidance effects as well as have a functional effect too. The appliance has been designed using CAD/CAM techniques. The appliance is soft and are shaped in the form of the normal parabolic shape of the dental arches that can straighten a five to seven year old child's permanent front teeth as they erept in to the mouth by using natural dental eruptive forces. The appliance can help eliminate buckteeth (overjet), crowding, overbite, openbite and harmful bad habits. Survey shows that out of 72 to 80% of the kids during the mixed dentition period walking in to a dental clinic with a complaint of mobile deciduous teeth, pain or extraction or routine dental check up has a malaligned teeth or some pressure habits such as mouth breathing, thumb sucking, tongue thrusting, lip biting, bruxism, etc. All these habits could lead to worsening of the orthodontic problem. In such situation usually a wait and watch approach is adopted by most of the dentist. With the advent of easy braces the treatment can now be started at an early age about six years i.e. at the beginning of the mixed dentition period & a favorable result can be expected. 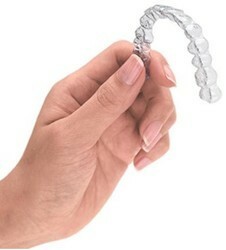 Minor malalignments & habits can be corrected with this appliance and in many cases extractions can also be avoided. Its unique retentive features prevents it from falling out while sleeping. The patented design ensures comfortable fit & helps increasing the patients compliance. Research says that pressure imbalance is the most important causative factor for malocclusion other than the general and local factors.The habits being, Thumb sucking, Finger sucking, Tongue thrusting, Abnormal swallowing habits, Speech defects, Respiratory abnormalities (e.g., Mouth breathing), Tonsils & adenoids, Bruxisim, Lip Biting etc. Identification of the possible etiological factors & attempt to eliminate the problem is the most important aspect of present day. Orthodontics where the situation is identified & intercepted before it blooms into a severe problem. These interceptive procedures would either eliminate or atleast reduce the severity of the problem thus making future treatment procedures more easy & stable. The Occlusal Splint -An effective solution for providing protection to teeth and restorations. Many people Brux, Grind and Clench their teeth at night and wake with a headache. Bruxism can lead to headache and TMJ Disorders and damages the teeth and restorations. Bruxism is a major cause of tooth attrition. If not treated, leads to severe damage to teeth. It is important to diagnose early signs of Bruxism and tooth wear, identify the exacerbating factors, and to intervene in order to arrest the process and prevent more severe damage. Factures of tooth substance are also common, particularly involving teeth with deep and extensive restorations. Patients with crowns, veneers, bridges, implants and inlays are prone to porcelain fracture, or catastrophic failure due to overloading. The overall forces of Bruxism are more severe during sleep and this is the time when most damage to restorations and teeth are likely to occur. PAPPYJOE Pappyjoe is an user friendly Multi- Networkable software which Doctors are using and simplifying the way they manage their practices. The advantage you have with Pappyjoe is that it scales ahead and grows with your practice from time to time.we have designed ALL in-one management system unlike anything seen before. Dental management software has proven its worth over the last several years set PAPPYJOE has now a new precedent of excellence, performance and success for years to come. Take your practice to a whole next level with PAPPYJOE today! pappyjoe is a tolerating dental software that is not as efficient as you! with pappyjoe you can say goodbye to Inefficient dental softwares. Our nanohybrid light activated composite contains a ytterbium fluoride mono-dispersed nano-sized particle which combined with regular silica and barium glass composes a state-of-the-art nano-filler system. It is indicated for direct esthetic restoration of anterior and posterior teeth. It is a high viscosity composite that will resist sticking to instruments, yet will have sufficient flow to adapt to the walls of the cavity preparation. It is radio-opaque and provides high compressive and flexural strengths along with a low water uptake. This nanohybrid composite can be used in all classes of direct dental restorations: class i, ii, iii, iv and v.